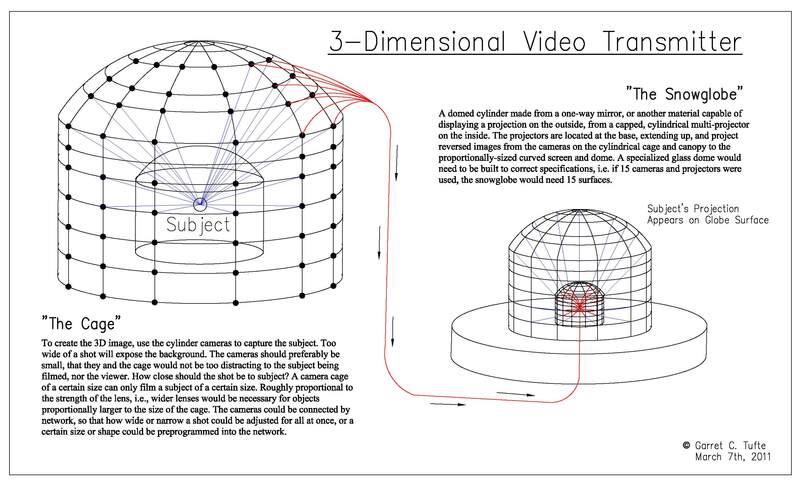 This is the first conceptual design for a 3-dimensional television: a curved, cylindrical box that would allow you to watch a subject from many angles, depending on where you looked at it. If, for example, there was a guy playing guitar, you could see him from the front at one angle, then walk to the other side of the device and see him play from the back. It is merely an arrangement of presently-existing technology, and requires only a bit of programming and fabrication to realize. Unfortunately, there are other, less intensive and bull-headed methods to achieve the same effect these days. And creating many of these items (and the camera apparatuses) is far too great an exercise in decadence to justify pursuit. Nonetheless, ya’ll may find it interesting.